We specialize in keeping your trees, shrubs, and hedges healthy. Does your landscape incorporate a large amount of trees, shrubs, and privacy hedges into your residential or commercial property? Have you just moved into a new-to-you home that has a large out of control privacy hedge or trees on the property that are up against the home or building and they are blocking natural light? In order to keep trees and hedges looking their best with healthy new, uniform growth, the old, dead, and dying branches must be trimmed back and pruned at least once or twice a year, sometimes even more depending on the species of tree or hedge and the weather. Irreco LLC is a full service landscaping company based out of St. Louis, MO. We specialize in the care and maintenance of trees, shrubs, and hedges for our customers homes, residential developments such as townhomes and condos and also commercial properties of all shapes and sizes. From pruning a large privacy hedge back into a uniform shape to maintaining all of the trees on your property, our team of tree and hedge care experts will be able to keep your trees healthy and looking great. There are limits to the tree work we can safely do for our clients because we are not arborists nor tree climbers. We can only prune and trim trees and hedges that we can reach with a ladder. This is typically trees and hedges that are under 20′ (feet) in height. If a ladder is not possible we can work with a trusted local arborist who can take care of any dangerous tree trimming and we can organize and supervise the process. For some very large hedges we can also rent man-lifts and have done so for large/tall hedges in the past. We start with our initial consultation. We will listen to your requirements, making any necessary suggestions. We will work with you to determine the trees and shrubs that need pruning. We show up on the scheduled days and prune and trim your trees and shrubs as promised. The end result is healthy trees and shrubs with a clean, uniform look. The final cost of your tree and hedge trimming will be determined by size and condition of the existing trees and shrubs. We’ll also need to consider the site accessibility. We’ll only be able to provide you with an accurate estimate for planting and maintaining your trees and shrubs after a thorough site inspection. Why Choose Irreco For Tree, Shrub and Hedge Trimming? We understand that you have many garden and landscape contractors to choose from throughout St. Louis. 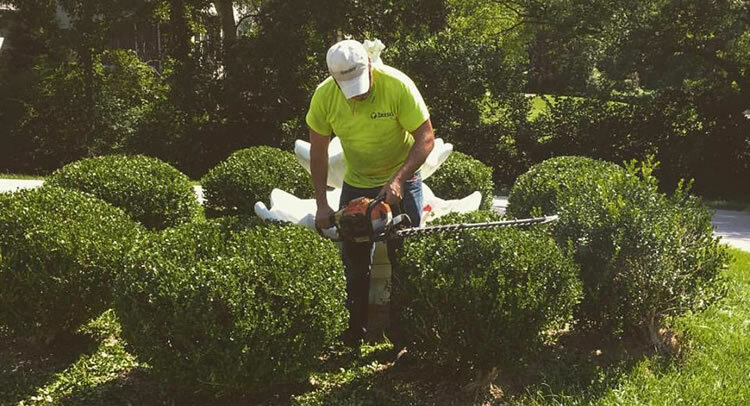 We just want you to know that when you choose to work with Irreco you are partnering with a small, locally owned business that has many years experience keeping the trees and hedges on St. Louis properties looking their best. You can expect knowledgeable, reliable tree and hedge trimming services from a company that cares about your properties appearance and our local reputation. If you’d like to get the process started then please give us a call (314) 246-0099 or fill out our online contact form and we’ll get back to you right away (usually the same day). We can then organize a time for one of our landscaping experts to visit your property and assess it, answer any questions you might have about the tree and shrub trimming process and then provide you with a competitive estimate to maintain your trees and hedges one time or on an-going basis. "The best in the business!!! Great service and great customer service!" "Very happy with landscaping, lighting & irrigation!" "Irreco has provided an excellent service for us over several years. It has been a delight to work with this firm. We highly recommend Irreco." Irreco LLC is a full service landscaping, lawn care, and irrigation (sprinkler system) company based out of St. Louis, MO and serving the St. Louis metro. We specialize in landscaping maintenance, landscape design, landscape construction, and irrigation system installations, repair, and service.